Rio Rancho, NM (April 19, 2017) — Lectrosonics announces the introduction of a new digital wireless monitor (IEM) system, the Duet. 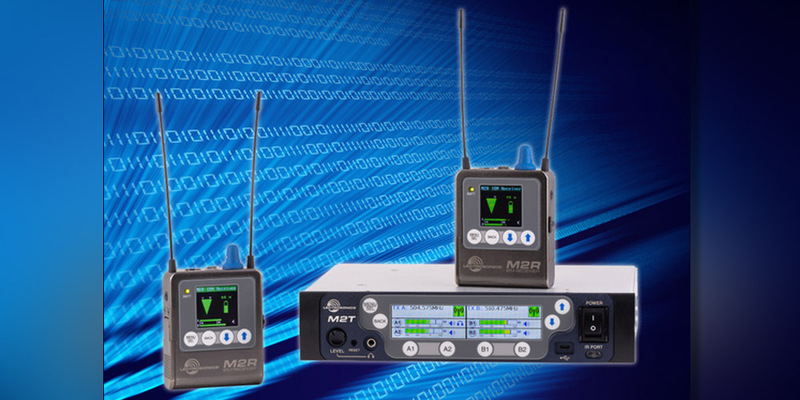 The new system consists of the M2T dual-stereo half-rack transmitter and M2R diversity belt pack receiver. The Duet covers the UHF frequencies of 470-608 MHz in a single range, uses digital modulation for transmission, and can accept analog or Dante digital inputs. The new system is designed and developed with professional touring, installation, theater, filmmaking and broadcast customers in mind. Both the M2R and M2T units have 2-way IR sync, so scan data from the receiver can be sent to the transmitter and thus onto the Ethernet network for use by Wireless Designer™ software for frequency planning and coordination purposes. Additionally, the system includes a FlexList™ mode, where a number of names and associated frequencies can be stored in the receiver. This way, a monitor engineer can quickly find and listen to any of the performers' mixes on the stage. "The Duet wireless monitor system is a significant step forward for touring performers and other professionals requiring high definition audio in their ears" states Karl Winkler, vice president of sales & service at Lectrosonics. "With 24 bit digital audio, low latency, Dante inputs and a compact, lightweight, diversity bodypack unit, the Duet system should please even the most demanding users, both on and behind the stage."